This month is Women’s History Month, an opportunity to recognize and honor the women we come from, the women we gain strength and inspiration from, the women whose struggles we grow from, and the women who guide us in life and in legacy. To kick off Women’s History Month, please join me in honoring one very brave woman who, right now, is accessing deep reserves of strength in the face of grave injustice--Crystal Mangum. 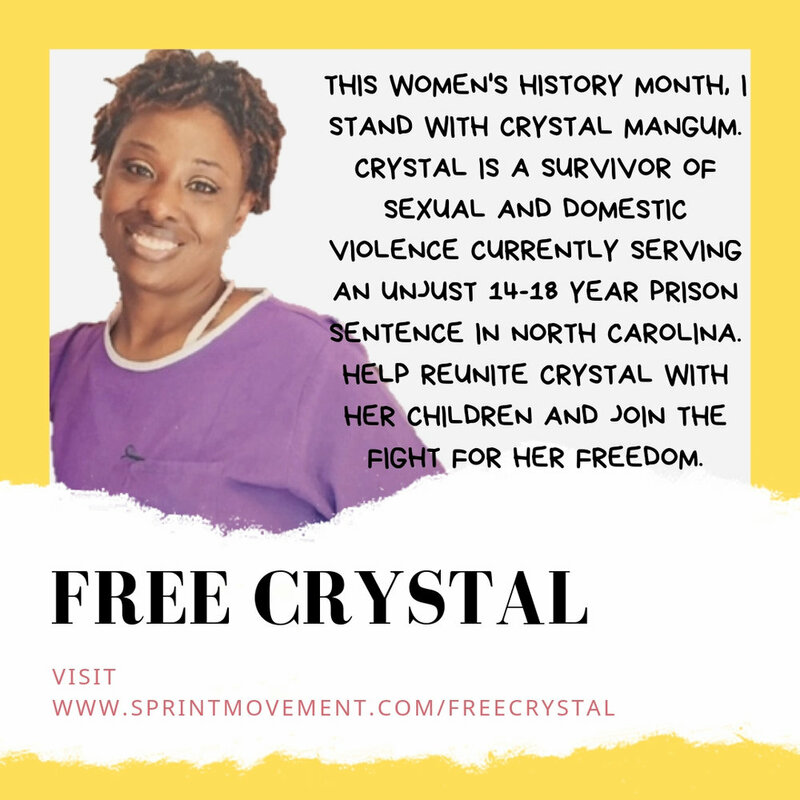 Those of you close to Sprint know that Crystal is serving a 14-18 year prison sentence in North Carolina due to an unjust criminal legal system that was supposed to “serve and protect” her when she experienced sexual and domestic violence. You’ll also know that Crystal’s faith, vulnerability, and creativity have served as a huge source of inspiration for this artistic endeavor, which is rooted so deeply in the belief that women’s struggles can offer powerful and profound lessons. It is thanks in no small part to this community that Crystal and I are gearing up for a fight to bring her home via the clemency process with a renewed sense of hope and purpose this year. As Crystal prepares for this fight, more than anything, she needs to draw strength from connection to family and support from broader community. Crystal has not seen two of her children, R.J. and Anna, in nearly two years. We have the opportunity to help send them to visit their mom this spring. Will you join me? In December, Sprint’s community of support helped raise $475 to send R.J. and Anna to North Carolina. Though we were unable to reach our goal in time for the holidays, we are still working to get them there spring, and we are half-way to our goal. This Women’s History Month, please consider making a donation and/or posting to social media.